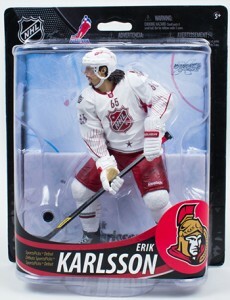 With just four figures, the 2013 McFarlane NHL 33 Sports Picks lineup has a relatively small number of players. However, for all but one, it marks their debut in the highly detailed, ultra-realistic line of figures. All four players have at least one variant chase figure as well. The biggest name in McFarlane NHL 33 is Steven Stamkos of the Tampa Bay Lightning. 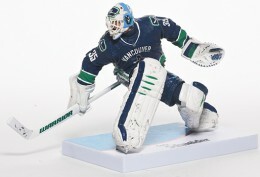 This is his second new figure after debuting in NHL 29 in 2011. His main figure has him taking a slapshot in his dark blue home jersey. The first variant has the sniper wearing an alternate jersey. This is easy to spot as it reads, "Bolts" down the front. Stamkos has a rarer second variant where he's in his white All-Star uniform. 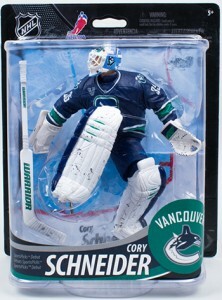 Goalie Cory Schneider makes his McFarlane debut. Having been traded to the New Jersey Devils during the 2013 NHL Draft, it's a little bit awkward as the figure has him in his Canucks jersey. The Cory Schneider variant has him wearing an alternate jersey. 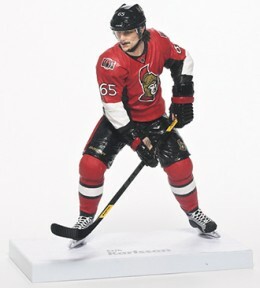 Also making his McFarlane debut is Erik Karlsson of the Ottawa Senators. 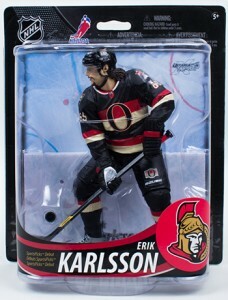 Besides his basic figure that has him wearing a Senators ome jersey, Karlsson has two chase variants. The more common one is an All-Star figure. The second, which is extremely rare, has Karlsson wearing a black striped jersey. 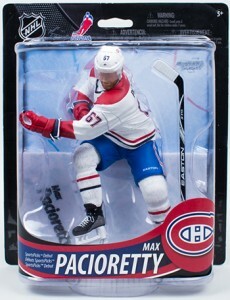 The final McFarlane NHL 33 figure is Montreal's Max Pacioretty who is shown mid-stride making either a pass or a shot. The regular figure has a red jersey. The variant shows him in a white jersey. You can see the entire 2013 McFarlane NHL 33 lineup below. Click on the tab above to get full variant figure details. Click on the figure names to shop for what you're looking for on eBay. 33 was the last of the McFarlane NHL line. Imports Dragon now holds the NHL and MLB licenses. I simply cant get into Imports Dragon figures as they look like caricatures instead of life like sculpts. Basically from a distance they look nice but up close they are severely lacking the details and quality of the McFarlane sculpts. With McFarlane barely releasing anything of substance nowadays with the NBA and NFL licenses simply getting out of collecting sports figures was an easy choice to make for me.